These headphones have some nice features to them, plus they are so comfortable. 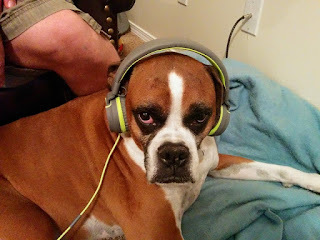 And beyond that, my dog was acting so silly when I would put them on, he would bark and turn in circles, so we decided to let him listen to music himself, so we got this funny picture of him listening to country music. The noise cancelling function is not as nice as the Bose set that we had in years past, but again, these are $18, not $350, and you still can get more than 50% of the noise cancelling effect as the Bose. They fold up nicely. I will be using them in my office for work, but when I travel, the folding design will be nice. One thing I like is that I can use it on my computer OR my phone, and I can use it for Skype or I can use it to make calls on my phone, or just listen to music. The microphone has 360 degree pickup. You can use it to answer or end calls, pause or play music, and if you are listening to music, move to the next song all with the little control buttons on this headphone set. It does have an ergonomic design that is comfortable. Real leather is soft. Overall, it is a nice headphone set, and I love the cord, which reminds me of shoelaces! Very clever.